It was really inspiring talking to Rishabh Lal, DSIM’s Ex-Trainee and a Freelancer. He vibrantly answered every question and shared his wonderful experiences. Read full interview here. A candid session with Ashima Nanda, DSIM’s Ex-trainee and a business owner. Here, take a walk through her DSIM’s journey and know how the training availed here is helping her achieve the business goals.Read full interview here. It was a warm and insightful conversation with Siddharth, Gulati, DSIM’s Ex-Trainee who shared his views on scope of digital marketing and also his experience of DSIM.Read full interview here. It was great talking to Suleiman Abdu Mritta, Ex- DSIM Trainee and Freelancer (Affiliate Marketing). 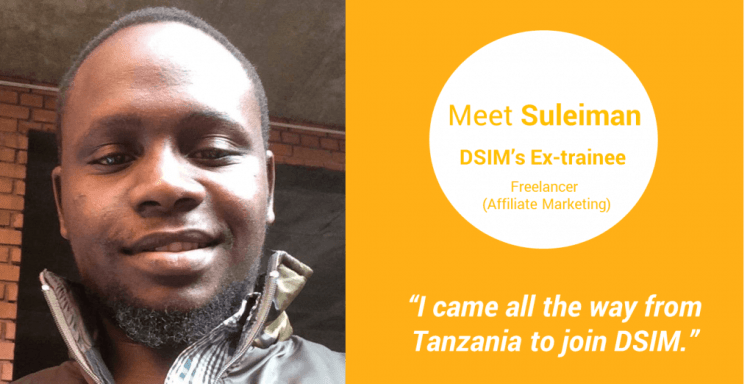 He came all the way from Tanzania to join DSIM and shared his experiences.Read full interview here. 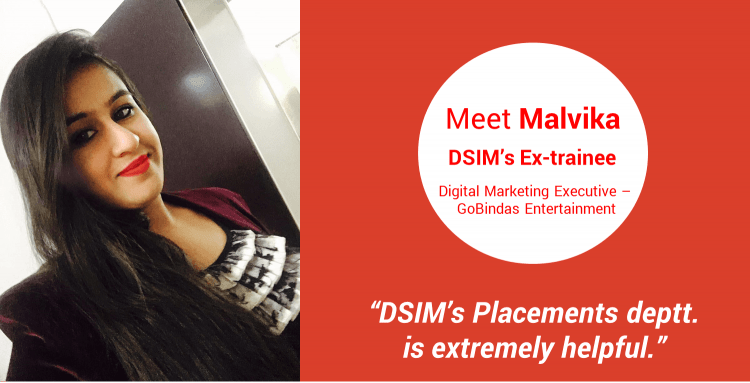 An interesting conversation with Malvika Batra, DSIM’s Ex-trainee and Digital Marketing Executive at GoBindas Entertainment. Read on the complete interview to know how she narrates her experience of learning digital marketing at DSIM.Read full interview here. In our conversation, we had Kush Rai, DSIM’s Ex-trainee and Brand Manager at Roca India. Read on the complete interview to know his experience at DSIM. Read full interview here. In our candid conversation, we had Rishabh Juneja, DSIM’s Ex-trainee and Graphic Designer. Read on the post to know how DSIM helped him to enhance his skills in digital learning to have a better career. Read full interview here. Here we shared some candid moments with DSIM’s Ex-Trainee Deepak Malhotra who was dynamic, and enthusiastic while sharing his experience at the institute. Read full interview here. Meet Vipul Tomar, DSIM’s Ex-trainee and a Social Media Executive at ‘Aakriti Production’. Read on the complete interview to know DSIM helped him to grow digitally. Read full interview here. It was an interesting session with Mandip Singh, Ex-DSIM-Trainee and a freelance photographer who answered several questions and shared wonderful experiences. Read full interview here. It was a candid experience talking to Gagan Chadha, DSIM Ex-Trainee and Sales Head at “Travel2Agent”. He has shared some notable views on his experiences while taking digital marketing training at DSIM. Read full interview here. We had an interesting session with Vivek Narayan, DSIM’s Ex-trainee and Freelancer. Read on the complete interview to know how DSIM helped him to get on the path of success in the best way possible. Read full interview here. It was a great conversation with a vibrant and young lad, Ayush Gautam, DSIM’s Ex-Trainee and Social Media Marketer at “Bread Jam Productions”. He lets us know how DSIM helped him choosing a digital marketing career. Read full interview here. An interesting conversation with Nitin Prakash, DSIM’s Ex-trainee and Digital Marketing Executive at ‘Vidza Technologies Pvt. Ltd’. Read on the complete interview to know how DSIM led him to explore different avenues and learn the most. Read full interview here. Meet Karan Singh, DSIM’s Ex-trainee and a Digital Marketing Executive at Eventum. Read on the complete interview to know how DSIM helped him to learn digital marketing from industry leaders. Read full interview here. In our conversation, we had Nikhil Khanna, DSIM’s Ex-trainee and Associate- Digital Marketing at ‘Sapient’. Read on the complete interview to know how DSIM helped him to understand the various shades of Digital Marketing. Read full interview here. Meet Shiwani Negi, DSIM’s Ex-trainee and Digital Marketing Executive at ‘Graphic Ads’. Here, take a walk through her DSIM’s journey and know what experiences have been around.Read full interview here. Meet Mahesh Hegde, DSIM’s Ex-trainee and Project Manager at Bose Company.Read on the interview to know how DSIM’s training helped him to understand Digital Marketing. Read full interview here. Meet Khyati Taneja, DSIM’s Ex-trainee and Digital Marketing Executive at ‘Value4Brand’. Read on the complete interview to know how DSIM helped her to augment her marketing skills. Read full interview here. Meet Rameez Raja, DSIM’s Ex-trainee and ‘Digital Marketing Executive’ at ‘Srushta Media Pvt. 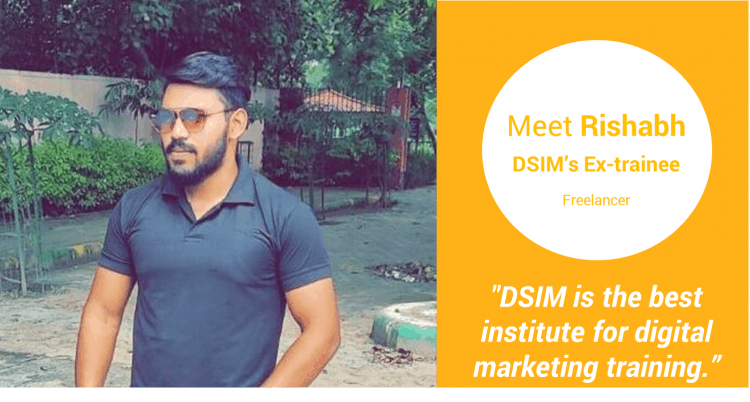 Ltd.’ Read on the post to know how DSIM helped him to pursue my dream of becoming a digital marketer. Read full interview here. Meet Devansh Singh, DSIM’s Ex-trainee and Digital Marketing Associate at ‘Conversion Bug’. Read on the complete interview to know how DSIM helped him to excel in his digital marketing career. Read full interview here. Meet Akshay Trehan, a Digital Marketing Specialist at ‘Myoo Works’. Read on the complete interview to know why he finds DSIM as India’s best digital marketing training institute. Read full interview here. Meet Ashish Kumar, Digital Marketing Executive at ‘Univer Solutions’. Read on the complete interview to know how DSIM turned him into a digital marketer. Read full interview here. Meet Sidvin Shetty, DSIM Ex- Trainee and Product Marketing Manager at ‘Techmart’. Read on the complete interview to know why he landed up in India to learn digital marketing at DSIM and what has been his experience here. Read full interview here. Meet Manish Rohilla, DSIM’s Ex-trainee and Assistant Manager- Marketing at Hero Electric Vehicles Pvt. Ltd. Read on the post to know how DSIM helped him to earn 7 lacs as a freelancer within a year. Read full interview here. Meet Shashanka Manakonduru, DSIM’s Ex-trainee and Digital Marketing Media Head with Paanini Ad Ventures, Hyderabad. Read on the post to know how DSIM’s training helped him to get a 6 lacs/annum job offer. Read full interview here. Meet Tarun Modi, DSIM’s Ex-trainee and Director, Modi Infosol (P) Ltd. Read on the post to know how he is rolling out changes & contributions to his 50 years old family business with DSIM’s training. Read full interview here. Meet Archit Gautam, DSIM’s Ex-trainee and Digital Marketing Executive at ‘Wunderman Advertising Company’. Read on the complete interview to know what secrets he has to share with us. Read full interview here. Meet Karan Kapoor, DSIM’s Ex-trainee and Founder of ‘EducationInsta’, an Online Education Portal. Read on the complete interview to know how DSIM helped him to make an entrepreneurial debut. Read full interview here. Meet Ridhima Sethi, DSIM’s Ex-trainee and a Social Media Analyst at Design Solutions. Read on the complete interview to know how she got this job with DSIM’s training. Read full interview here. Meet Saahil Bajaj, DSIM’s Ex-trainee and a Social Media Strategist at ‘Wealth Discovery’. Read on the post to know what have been Saahil’s experiences at DSIM. Read full interview here. Meet Premananda Kanthi, DSIM’s Ex-trainee and a Freelancer. 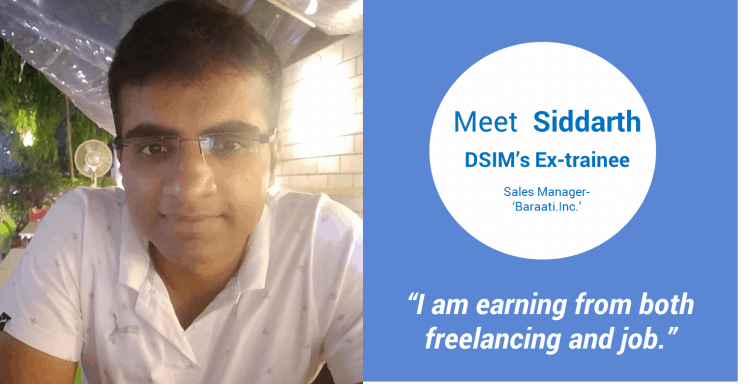 Read on the complete interview to know how DSIM helped him to begin as a freelancer. Read full interview here. Meet Shilpi Prasad, DSIM’s Ex-trainee and a PR Consultant with ‘Text 100’. Read on the post to know how she carries desirable and impactful communications with & for brands. Read full interview here. Meet Tarun Sharma, DSIM’s Ex-trainee and Digital Marketing Executive at Value4Brand. Read on the complete interview to know how DSIM helped him to attract potential career opportunities. Read full interview here. Meet Saurabh Midha, DSIM’s Ex-trainee and Social Media Marketer at ‘Zeeten Cybernetics’. Read on the post to know how DSIM helped him to enter into digital industry. Read full interview here. Meet Nitin Kumar, DSIM’s Ex-trainee and Co-Founder at ‘LETS THINK INTERACTIVE’. Read on the post to know how DSIM helped him to start his own digital marketing agency. Read full interview here. Meet Himanshu Rai, DSIM’s Ex-trainee and an SEO Executive at ‘Saffron Tech Pvt. Ltd.’ Read on the post to know how DSIM brought him closer to professional success. Read full interview here. Meet Priyansh Srivastava, DSIM’s Ex-trainee and Digital Marketing Manager at StartupED. Read on the post to know how DSIM’s training helped him get a job of 4 lacs salary package. Read full interview here. Meet Abhinandan Kumar, DSIM’s Ex-trainee and an SEO Executive at Value4brand, a leading Online Reputation and Digital PR company in India. Read on the post to know how DSIM’s training helped him to become a marketer. Read full interview here. Meet Tanya Pahwa, DSIM’s Ex-trainee and Founder, Tanya’s Homes. Read on the post to know she started her online business with the aid of DSIM’s training. Read full interview here. Meet Prashant Kumar Chaubey, DSIM’s Ex-trainee and Digital Marketing Intern at Magical Dreams Production Pvt. Ltd. Read on the complete interview to know how DSIM’s placement team helped him to start his career. Read full interview here. Meet Ujjwal Sinha, DSIM’s Ex-trainee and a PPC Consultant at Digitalabs. Read on the complete interview to review DSIM’s role in his digital marketing career growth. Read full interview here. Meet Avinash Kumar, Digital Marketing Manager at Momentz and DSIM’s Ex-trainee. Read on the post to know why he is recommending DSIM to other learners. Read full interview here. Meet Sandeep Patel, DSIM’s Ex-trainee and Businessman. Read on the complete interview to know how DSIM taught him to leverage digital marketing in his business. Read full interview here. Meet Dikshant Kumar, DSIM’s Ex-trainee and Social Media Analyst at Virtual Employee Pvt. Ltd., Noida. Read on the post to know how DSIM’s training helped him to become a capable marketer. Read full interview here. Meet Sagar Rastogi, DSIM’s Ex-trainee and Co-founder of Digital Marketing Players. Read on the post to know how DSIM’s training helped him to begin his own digital marketing agency. Read full interview here. Meet Mohammed Faiz, DSIM’s Ex-trainee and a Project Coordinator at ‘Mark & Orion Ventures Pvt. Ltd.’ Read on the post to know why he joined DSIM to learn digital marketing. Read full interview here. Meet Sagar Kumar, DSIM’s Ex-trainee and Digital Marketing Manager at ‘Weightshake Factory’. Read on the post to know how DSIM helped him to figure out his hidden potential. Read full interview here. Meet Soudip Chakrabortty, DSIM’s Ex-trainee and a Digital Marketer at ‘Axis Tutorial.’ Read on the complete interview to know how DSIM helped him to continue within the space immaculately. Read full interview here. Meet BK Niresh Kumar, DSIM’s Ex-trainee and ‘Digital Marketing Intern’ at ‘ABC World Media’, Noida. Read on the post to know how DSIM training helped him to take on this difficult career move. Read full interview here. Meet Shubham Bhatt, DSIM’s Ex-trainee and ‘Digital Marketing Executive’ at ‘Value4Brand’. Read on the complete interview to know how DSIM helped him to grab a promising marketing job. Read full interview here. Meet Nayan Nitesh, DSIM’s Ex-trainee and a Freelancer by choice. Read on the complete interview to know how DSIM helped him to earn big in freelancing. Read full interview here. Meet Lalit Chaudhary, DSIM’s Ex-trainee and a Digital Marketing Executive. Read on the complete interview to know how DSIM helped him get hired as a digital marketing executive. Read full interview here. Meet Sneha Chopra, DSIM’s Ex-trainee and ‘Digital Marketing Consultant’ at ‘9Zest Corporation’, a Health and Fitness IT startup. Read on the post to know why she found DSIM as a place to learn digital marketing. Read full interview here. Meet Manidipa De, DSIM’s Ex-trainee and Digital Marketer at ‘E-India Digital’. Read on the complete interview to know why she finds DSIM as a genuine source to learn digital marketing. Read full interview here. Meet Piyush Pandey, DSIM’s Ex-trainee and Marketing Manager at ‘Presidency International School’. Read on the complete interview to know how DSIM helped him to get on the actual learning. Read full interview here. Meet Nisha Pilania, DSIM’s Ex-trainee. Read on the complete interview to know how DSIM helped her to learn things digitally that she didn’t know before. Read full interview here. Meet Ravinder Kumar, DSIM’s Ex-trainee. Read on the complete interview to know how DSIM became his career guide. Read full interview here. Meet Polavarapu Sri Hari, DSIM’s Ex-trainee and Digital Marketing Executive at United Medical Consultancy (UMC). Read on the post to know how DSIM helped him to take a pleasing career ride. Read full interview here. Meet Sandeep Meganath, IT Executive at ‘ACM Healthcare’. Read on the post to know what he earned huge out of his association with DSIM. Read full interview here. Meet Shiva Shankar Reddy, DSIM’s Ex-trainee and ‘Digital Marketing Consultant’ at ‘Half Full Creatives’. Read on the post to know how DSIM’s training turned him into a digital marketing professional. Read full interview here. Meet Parul Bansal, DSIM’s Ex-trainee and Social Media Executive at Astro Science. Read on the complete interview to know how DSIM helped her get this job. Read full interview here. Meet A.Mahesh, DSIM’s Ex-trainee and Product Executive at ‘Cognizant’. Read on the complete interview to know how DSIM helped him to build career in digital marketing. Read full interview here. Meet Vishwesh Mehendale, DSIM’s Ex-trainee and Web Developer at Adbot India Pvt. Ltd. Read on the complete post to know how DSIM’s placement team brought this job opportunity to him. Read full interview here. Meet Nataliya Singh, DSIM’s Ex-trainee and Sr. Social Media Executive at ‘Astro Science’. Read on the complete interview to know how DSIM helped her to take off her career to a good start. Read full interview here.